Plans to turn Bristol's Memorial Stadium into an 18,000-seat stadium for Bristol Rovers FC and Bristol Rugby Club are being submitted. Previous attempts to develop the site have failed as residents living nearby are concerned about increased congestion and lack of parking spaces. This time the club has spent 11 months consulting residents and has held six exhibition days. A decision on the development could be made by the city council by Christmas. If approved, work could start early in 2007 with completion in time for the 2009 season. The club said the revised plans also included accommodation for 500 students, a 112-bed hotel and a large restaurant. 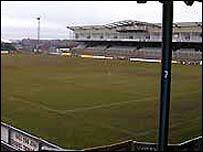 Bristol Rovers FC bought the stadium from Bristol Rugby Club in 1998, who they now share it with. The current capacity for the stadium, which was built in 1921, is 12,000.